So I guess I'm a little late to the party with this one, but as I was finally beating Portal last night I realized that this was just so obvious and mandatory for a collection like mine. I had to take action. You can find other versions of the cake pretty much everywhere (floating around on the web with labels like "the cake is not a lie!) but I wanted to make mine the most accurate and tasty. I'm sure most of you nerdy types, and even some of you fabled "cool people" have seen the phrase "the cake is a lie" on t-shirts and in your social networking stratosphere and pretty much everywhere else. This phrase can be be traced to the beloved and critically acclaimed video game titled "Portal." In Portal, you are made to navigate a research facility using a device which allows you to create portals between two points on any flat surface. During this you are monitored and "guided" by an artificial intelligence named GLaDOS who promises you cake and grief counseling at the conclusion of the test. There is an easter egg in the game itself where you can find a recipe for cake written in binary code, but the recipe is only an ingredients list for plain chocolate cake and lacks instructions (though it has some great suggestions for garnishes). 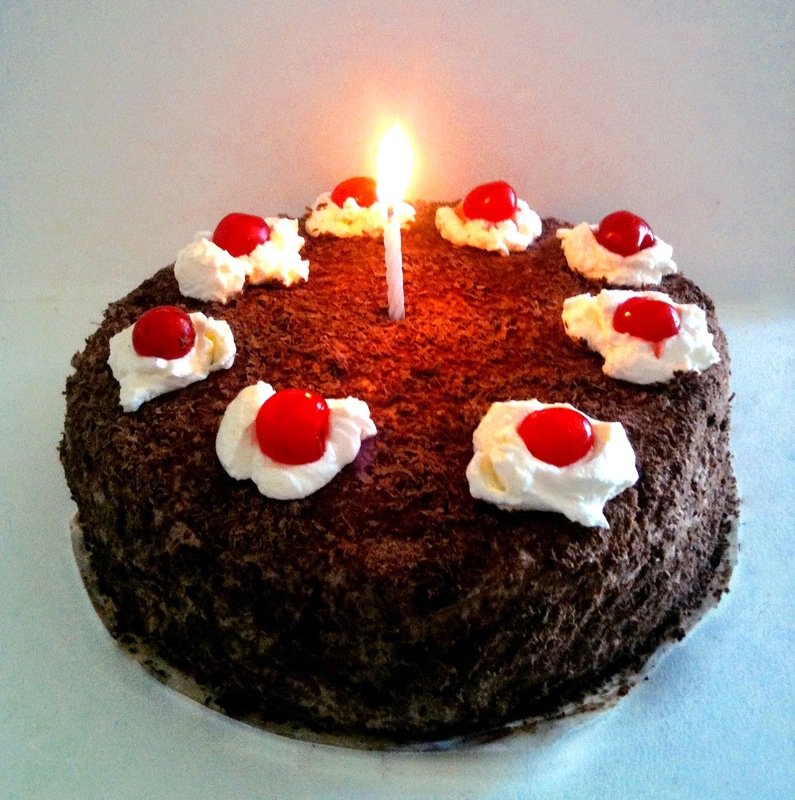 According to the developers, the design of the cake was inspired by a cake at the chinese bakery near their place of work, identified as a Black Forest cake. Black Forest cake is a kind of German cake that uses chocolate, whipped cream, cherries and a cherry flavored liquor called Kirschwasser. So today I have made for you a recipe of my own Black Forest Cake, delicious and moist and worth all the trouble, even being shot by cute little sentry guns. It has four layers, is filled with boozey chocolate cherry goodness, and the result should look just like the one in the game. Bake this cake and throw a big party that all your friends are invited to! Don't forget to invite your weighted companion cube... Oh wait. Never mind. 2) Grease and flour two 8 inch cakepans, or line with parchment paper. 3) Sift together the flour, the cocoa, the baking soda and the salt. Set this aside. 4) Beat the shortening and sugar together until they are fluffy. Add the eggs an vanilla and beat thoroughly. 5) Slowly beat in the flour mixture, occasionally alternating with the buttermilk. Beat until combined. 6) Pour the batter into the cakepans. 7) Bake for about 35 or 40 minutes (or until a a fork or a wooden pick comes out clean when inserted into the cake. Let the cake cool completely. The cake will be easier to cut if you keep it in the fridge for a few hours before cutting. 8) After the cake has cooled, cut each layer in half (horizontally) to make four total layers. Sprinkle the layers with the 1/2 cup of Kirsch. 9) Drain the canned cherries in a colander to remove most of the juice. 10) Beat the whipping cream with confectioners' sugar until it thickens to desired texture. 11) Put a small amount of the cream/sugar mixture aside for garnish. Mix the cocoa powder into the remaining majority of the whipped cream frosting. 12) Place one cake layer on the serving dish you wish to use. Spread about one 6th of the whipped cream on the layer, and strew a third of the cherries on top of the whipped cream. 13) Add the second cake layer on top of the first. Spread one 6th of the whipped cream on the second layer and 1/3 of the cherries on top. 14) Add the third cake layer. Spread 1/6 of the whipped cream on that and add the remaining cherries. 15) Top with the last cake layer. Frost the top and sides of the cake with remaining frosting. 16) Use a potato peeler on the chocolate to create thin shaves. Gently pat the chocolate shaves on to the sides and top of the cake, completely coating it. 17) Use the whipped cream you set aside earlier to place eight small circles around the top of the cake. Place your non-stemmed maraschino cherries on each one. 18) Place white candle in the center and light. Congratulations, you have made the cake a reality! Photo by Anna of Sixty Four Color Box, from the post "Not a Lie!" So glad to have you back! This looks like a great weekend baking project. 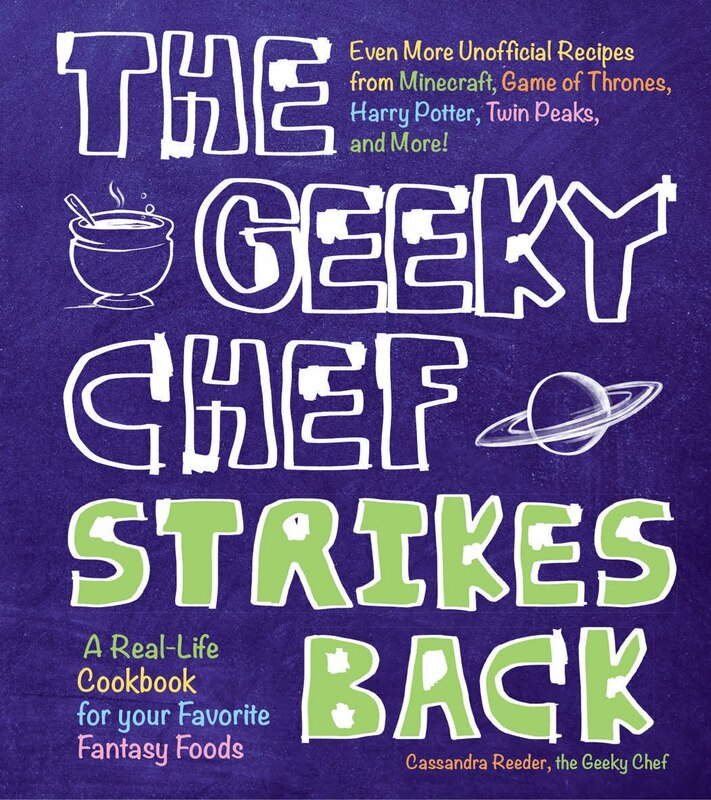 Always nice to find a geeky recipe that is not simply a minor tweak on a random dish, let alone something completely original. After scanning pages upon pages of 1-up cupcakes and the slightly mad creations of famished teenagers, I was ecstatic to find you had posted another great recipe. Fantastic. where can this fabled "kirsch" be found? in the liquor store .... make sure to take an adult with you. Oh wow. I have just found this blog and I love it. Amazing, amazing! This cake is especially good, but I love all the influences here, and glad that someone else finds the connections between Stephen King or Neil Gaiman and baking! Please keep posting! Love, the apocalypse bakery. 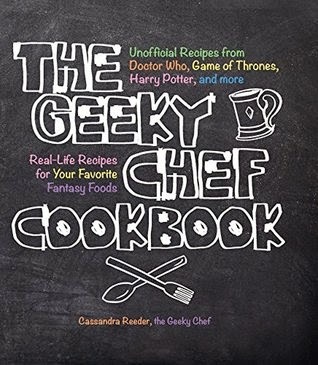 Hooray, The geeky chef makes another post! Nice one, my fellow geek. I made this a few months back but it came out semi lopsided. Kudos on the excellent blog. I don't know... This seems like a lie.. THIS IS A REALLY GOOD RECIPE! I've made some different, because I can't find all of the ingredients in my home, but it became really delicious and moist. 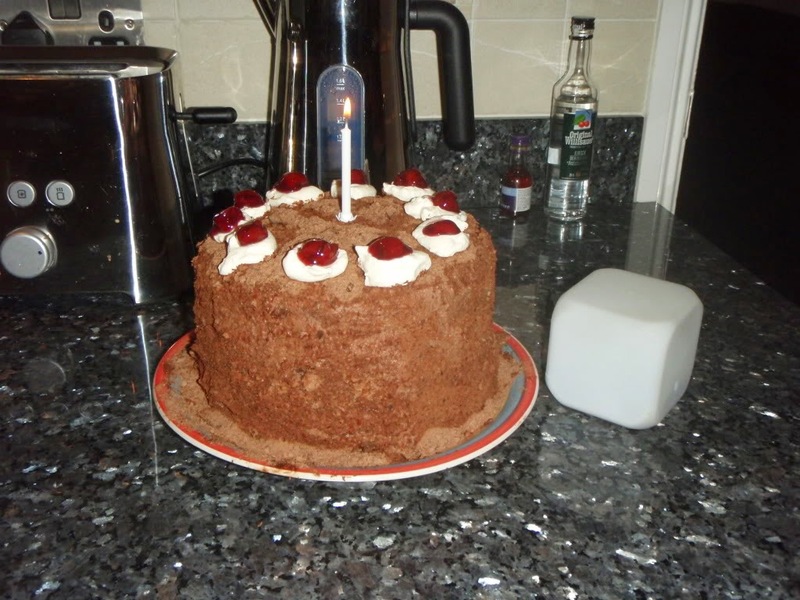 If you want to do a great chocolate cake (not only portal cake), use this one! finally someone got it right, ive been looking every where for this THANK YOU! Wow... This looks like an amazing cake to make! One problem though; I probably won't be able to buy the Kirsch, because I'm underage. Is the cake alright without it? The cake should be fine without it (edible but maybe a little dry or bland), but I would recommend using some other cherry flavored liquid instead. Perhaps grenadine in half the amount? Excellent recipe, the first cake I've ever made and it turned out perfect. I used butter instead of veg. shortening and it still works out great. It's hard to overstate my satisfaction! I love this cake!! It's so yummy, it was a bit of a hassel for me to make, but that's only because I'm a hopeless fool who doesn't own the proper equipment. That aside, this is so delicious! I love it! I absolutely LOVED making this cake, the only trouble I had was with the chocolate shavings at the end, does anyone have a solution to keep them from melting before they even get on the cake? My hands were coated in chocolate. Anon above, I would refrigerate my chocolate bars first. It makes them melt a lot slower! Wait, what about the rhubarb!? How perfect!! I am making this for my husband's birthday next week! He'll be so surprised! I love the Zelda recipes, too. What an awesome blog! What happened to the fish shaped crackers, fish shaped candies, fish shaped solid waste, sediment shaped sediment, and pull and peel licorice? Just kidding. LOVE this recipe. My birthday's coming up, I'm definitely using this recipe. I miss the aluminum head positioner. How big is this cake? How many does it serve? 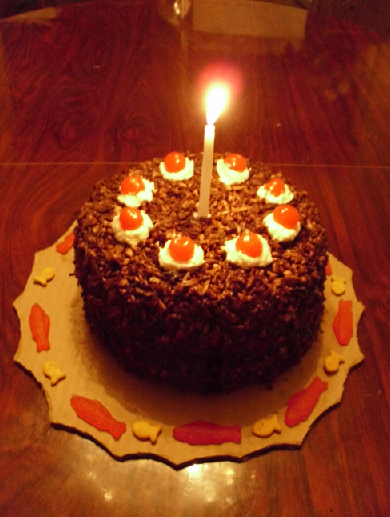 I've made a similar cake for my son's 16th birthday today. I've got 8 red gobstoppers for the top, at his request, hope I don't choke anyone. Was just looking for pictures so I get the presentation right - your cake looks great. Fingers crossed for mine! I just finished making this as a treat for my friend, and it turned out great! It wasn't that hard to do either, which was good for someone like me, who has little to no baking experience! Oh, this looks like a divine cake!!! Hey! This was posted on my birthday! Sliced almonds, mixed with a little vegetable oil, then coated liberally with cocoa powder until a dark brown. Mix with chocolate shavings if desired before pressing into the frosting surface. I'm not sure what went awry but the layers were rather flat -- actually collapsed a bit -- after I took it out. I admit I'm not a highly experienced cake baker, but is 1.5t baking soda enough? Or was it due to using butter rather than shortening? if i can't find the Kirsch, would amaretto make a good substitute? It could also be called Kirschwasser, but it's the same thing. Don't know if that helps, I have seen it at most grocery stores. You will want to use another cherry flavored liquor if you can't find Kirsch. You could probably also use grenadine, but not as much of it, it's very sweet. I don't actually like chocolate but a friend got me this cake from Regent Café and Bakery for my birthday anyway simply because it was The Cake. Since it's a Chinese place it's super light cake, almost like whipped cream, a kind of mousse texture. My attempt.. It went perfectly, except for the chocolate garnish. I should have used two chocolate bars, not one. I made this cake for my brithday and it was delicious everyone loved it and everyone cried when i ate the last piece :P . I just made some little changes to make the preparation more simple. First i changed the filling with homemade caramel sauce : http://www.foodnetwork.com/recipes/ree-drummond/easy-caramel-sauce-recipe/index.html and then i covered the cake with buttercream (made by mixing 125 g of butter with 1 tbsp of warm milk and 175 g of confectioners sugar) and sprinkled the cake with brownies frosting (Check the 4th step here http://allrecipes.com/recipe/best-brownies/ ). This was the result: https://plus.google.com/photos/117603489333264854430/albums/5871454343731240769 I didn't have a 8 inch pan so it turned out a little bit shorter than the original one. This must be too good to be true. 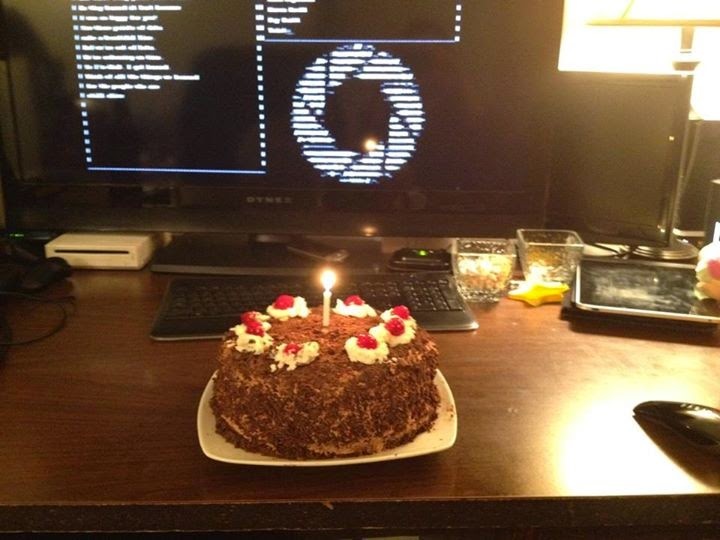 I find the perfect recipe for Portal cake just in time for my birthday. Time to send my little sister out on a quest for the perfect lie. Mwahahaha. Three words. You. Are. Awesome. Have an Aperture Science Positive Reinforcement Affirmation Sticker! You didn't put pecans in it! 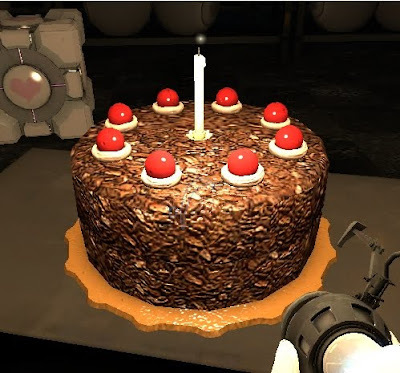 GLaDOS says in the game that it has a "lovely pecan frosting"
Well I'm GLaD someone got an accurate cake recipe from Portal. Do you know if the cake has to be refrigerated afterwards? I'm planning to make it for my boyfriend and I have to bring it to the party in the evening, would I have to refrigerate it all day until then? Also, I would be putting on the cherries and candle and stuff last, so could I just leave the cake out or should it be refrigerated during the day? Similar to a Black Forest Cake. Can I use cherry brandy? Because I totally used cherry brandy. Here's hoping it works out!